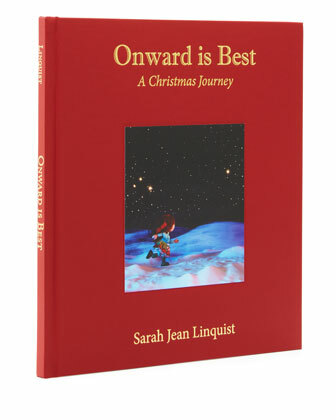 It’s coming up to holiday season, and this is the time of year I like to suggest that you look into purchasing a copy of “Onward is Best: A Christmas Journey.” This is a book written by my little sister, an artist, before she died. 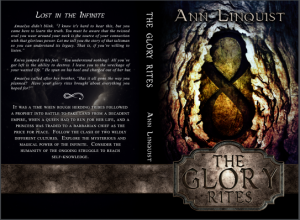 My other two sisters and I completed the writing for her, and my daughter did the layout and book design. It’s a treasure. You can find it at Neiman Marcus online if you search their book section. Here’s their blurb and thanks for looking into this. —Mary EngelbreitOnward is Best: A Christmas Journey is a fun adventure storybook to be read out loud. You will follow Dolly and her strange friends as they travel through magical lands, all hand crafted by the author, artist Sarah Jean Linquist. Started while she had cancer, Sarah spent over 6,000 hours on her dream project. Completed by her family as an act of love after she died, this beautiful, heirloom quality book is certain to become a new holiday tradition in your own family. Book design by Carrie Ehrfurth. 12 1/4″W x 13 1/4″T x 3/4″D. I have this book and it is wonderful. My grandkids enjoy the story and the illustrations! Thanks, Parrot. I’m so pleased that your grandkids enjoy it. I do too! I have this book for my family and bought one for another family member. We all have enjoyed it and I still marvel at the illustrations. It’s truly a wonderful creation by a wonderful family. This is great news. I don’t have any grandchildren yet, but I know this will be a family tradition for us. I still read it every year. Thanks for your posting! I have the book also. Lovely book.